Not got much time or just want the bullet points on how to make these? Click here for the Quick Read Instructions. By the time October rolls around, my kids are in danger of being buried in an avalanche of all the conkers they’ve collected. To avoid this fate, we’ve found all sorts of ways to make use of them, but at the end of October this simple autumn activity goes to the top of the pile, as it makes a wonderfully easy Halloween craft for kids to enjoy. What’s more, we’ve found ways to make this a learning activity too, without spoiling any of the fun! 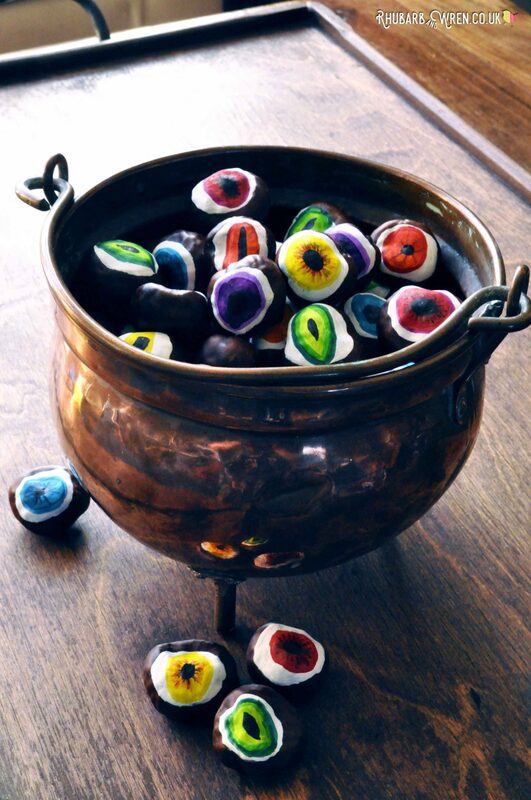 A cauldron full of monster eyes makes the perfect Halloween decoration! I love using this Halloween activity as an opportunity to sneak in a little learning along the way! So before we started making our monster eyeballs, we had a quick chat about the different parts of the eye. We looked into each others eyes, naming the pupil, iris and sclera (the whites of your eye). We also described their shape and the colours we could see. This is a great way to help develop observation skills as well as adding to their knowledge and understanding. All by simply looking at an eye and describing what they see, then using that in their art. 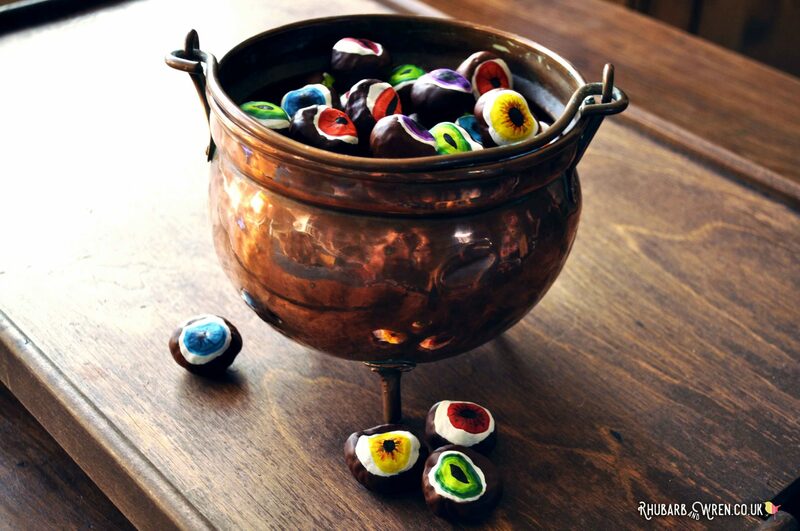 A witches brew of eyeballs – perfect Halloween decor. 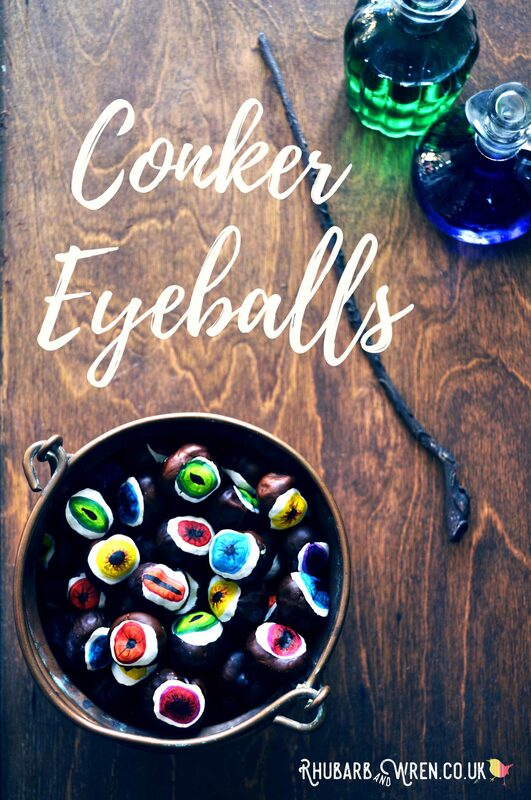 You could leave it at that, but when you’re making conker eyeballs, you might want to show the kids’ different kinds of eyes too. A quick internet image search will bring up loads of fantastic eye pictures to look at. Our favourites were cuttlefish, goats, geckoes, frogs, mantis shrimp, horses, reptiles, cats, stingray, insects and owls as these all have amazing eyes which should give the kids plenty of inspiration. Mine were fascinated to learn that cuttlefish have W-shaped pupils, for example. 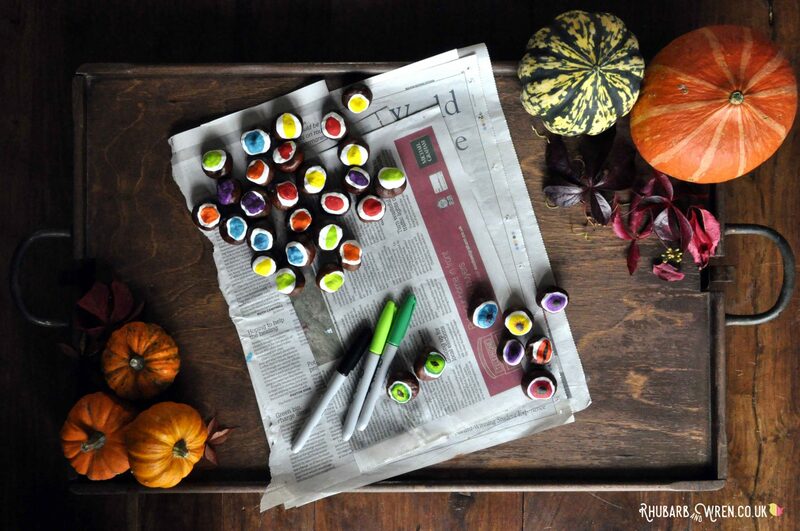 Colourful eyeballs make for great Halloween play resources. I also found some great eye educational resources to help us look deeper into the sense of sight. Check out my resources list at the bottom of the post for our favourite webpages, videos, books and apps for kids on the wonderful world of eyeballs. Who says Halloween can’t be educational?! 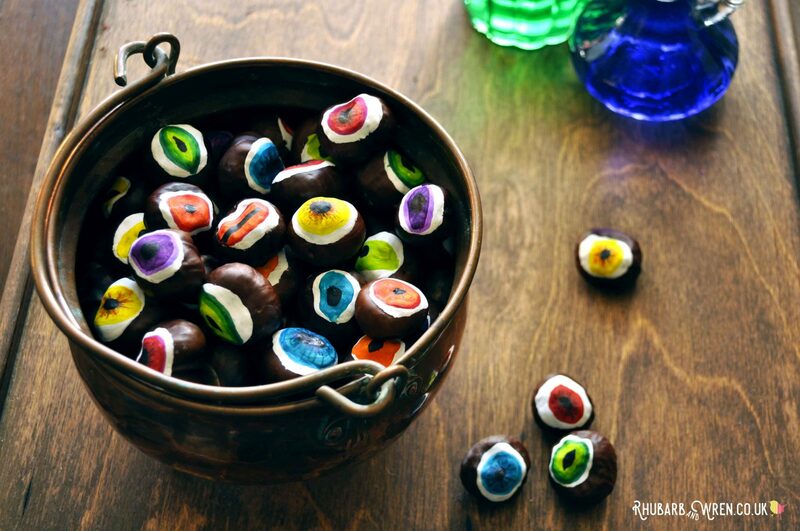 These conker eyeballs are ridiculously simple to make. However, there are a few tricks to getting the most out of this spooky craft. This is how we made ours! 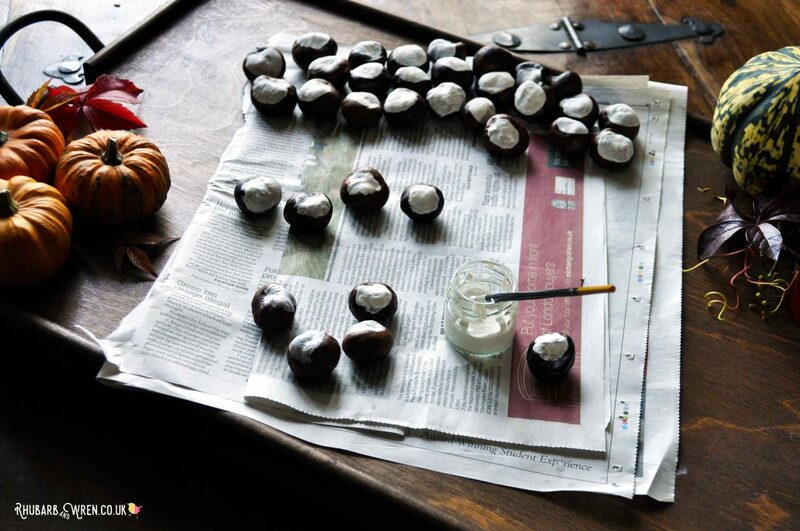 Start by painting white the rough part of a horse chestnut only. This white base coat will be the sclera or white part of their eyeballs. Appropriately enough for this craft, paint will stick best on the rough ‘eye’ of the conker. 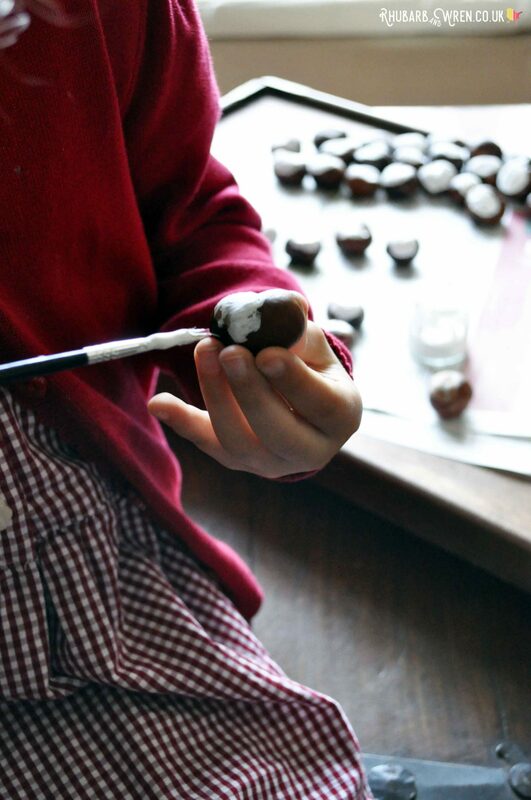 If the kids want the whole of their conker eyeballs white, they will need to prep the conker with a coat of PVA glue first. This is because paint doesn’t stick very well to the shiny surface so will just flake off without the base coat. This craft is a fine motor skill challenge for little ones! To get a really thick and bright layer of white paint, the kids may need to do two coats. However it only took about ten minutes for the paint to dry enough for a second coat to be done. So by the time we’d finished painting all of ours, the first ones were ready for painting again! Smooth, white, paint just begging to be drawn on! 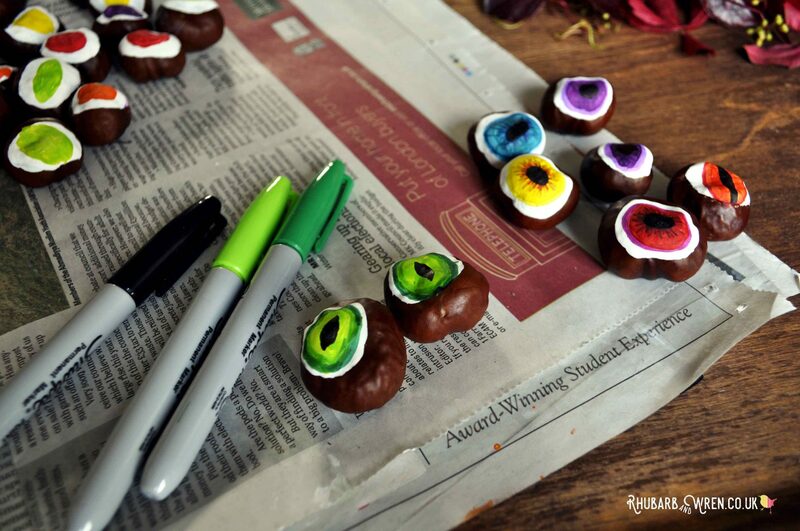 Painting on the irises for our Halloween eyeballs! 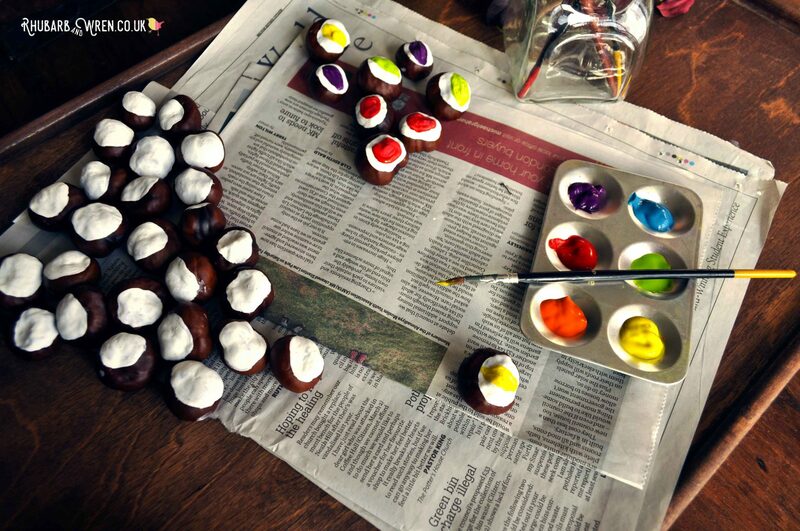 Once the white paint is dry, get the kids to choose their conker eyeball iris colours. We used paint for these, or alternatively the kids could do the iris with felt-tip pens, since they’ve got a nice, bright white background to draw on. Just like pupils, irises can be different shapes. 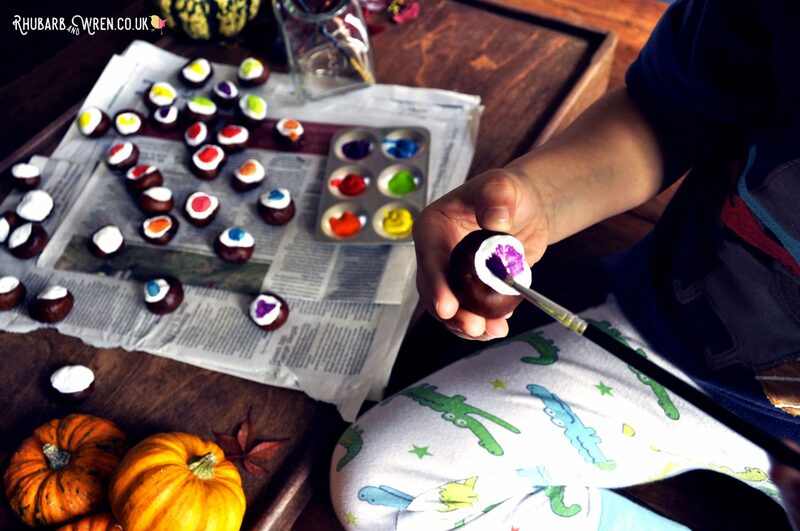 We made the irises of our DIY conker eyeballs all different shapes and colours. Some were oval, others round, or even square. Monster eyeballs, dragon eyes or zombie peepers – what will your kids make? As with the white paint, we did a couple of coats to make sure that the irises had a solid, even, colour. Once the last coat had been done, though, we gave our conker eyeballs a good, long time to dry fully before we added the final touches. The final stage! Use felt tip pens to add the pupils and fine details. Once the paint is completely dry, it’s time to add the final features. So use felt tip pens to draw in the eyeball pupil and any fine extra details the kids want to include. 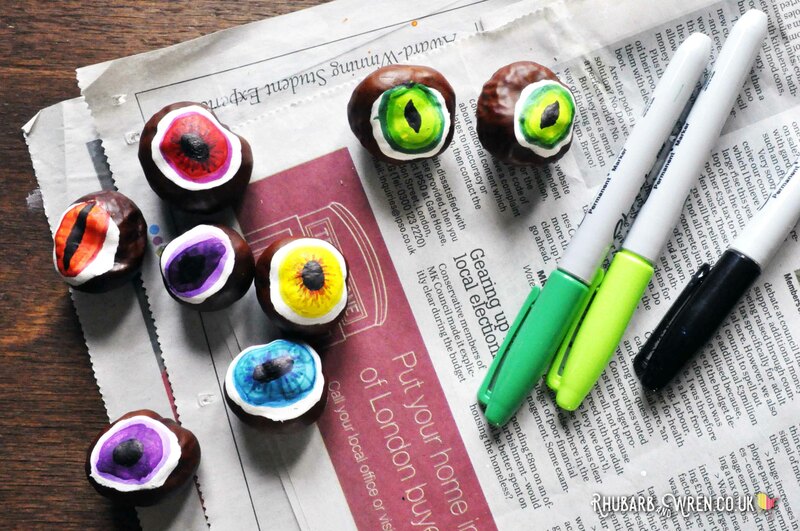 Just as with our irises, we made the pupils of our conker eyeballs all different shapes. Use similar colours to add patterns to your irises. We looked at pictures of cuttlefish, geckoes, goats and alligators for some real-life examples of pupils in nature that are particularly strange! Studying pictures of real eyes will help kids find details they can add to their own Halloween eyeballs. Felt tips work wonderfully for this final stage, as they allow the kids to add delicate details. We drew lines and rings of colour as well as adding our pupils to our conker eyeballs. And that’s it! 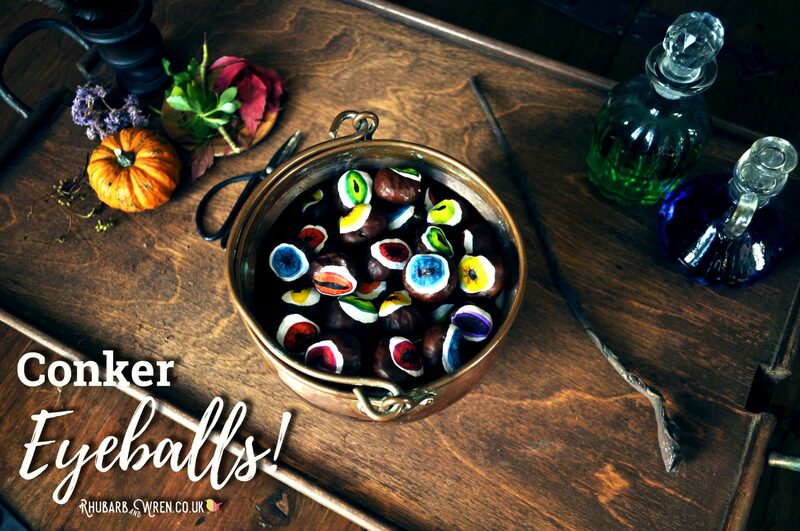 All done – their wrinkly old conkers have been transformed into spooky conker eyeballs, perfect for Halloween! 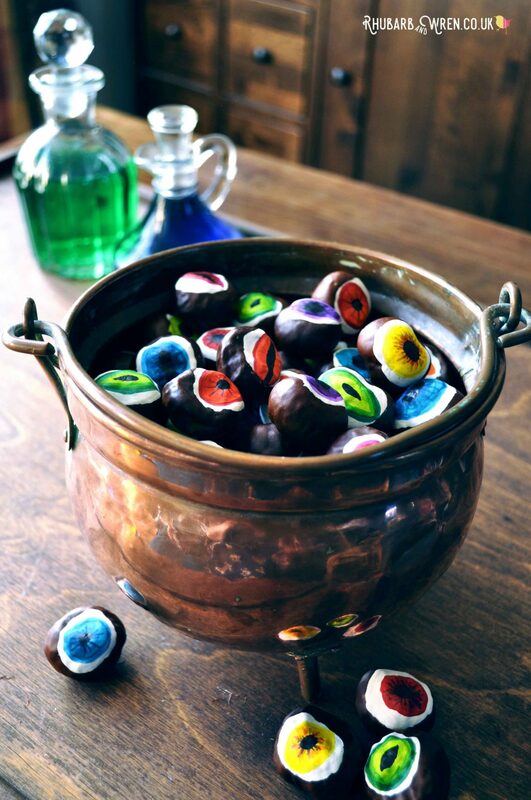 We’ve made bowlfuls of these conker eyeballs to use as Halloween decorations, ingredients in a bit of witchy caldron pretend play, or to thread together to make a ghoulish DIY conker eyeball necklace. If you want to thread yours on string too, it’s easier if you make the holes BEFORE you decorate them, to avoid damaging the eye art. We used our (affiliate link alert!) kids conker drills and holder to make the holes. 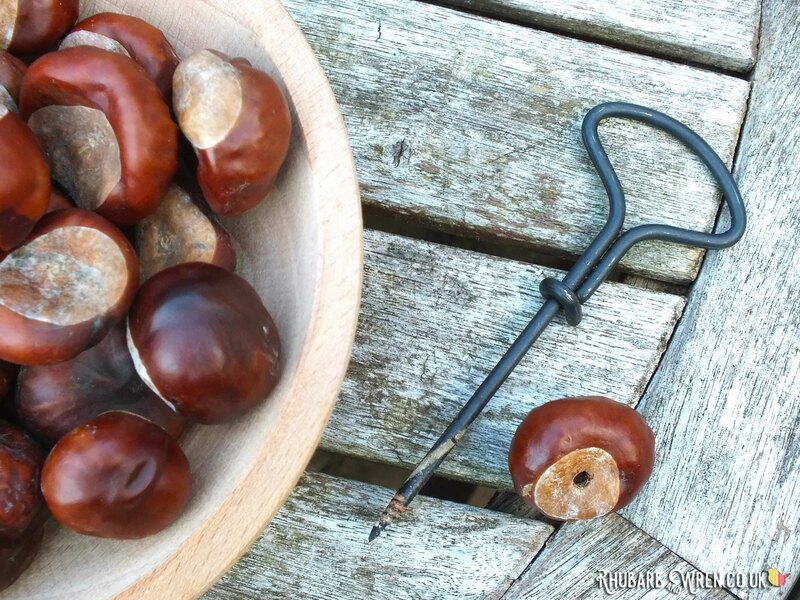 These are great little hand tools that allow kids to make holes in the horse chestnuts safely, all by themselves. We bought our set for playing conkers, but have ended up using for all sorts of crafts and makes! We LOVE our conker drills! Makes making a hole a cinch. This youtube video from KidsHealth.org on How Your Eyes Work is a fun and fascinating 5 minute watch (I learned loads, and the kids watched it twice in a row!). National Geographic Kids has a webpage all about our own amazing eyes. Get the kids to take this BBC picture quiz, guessing which eyes belong to what creature. Scholastic Books have a great little kids book exploring the question that will inevitably come up during this craft – (Amazon affiliate link) What if You Had Animal Eyes!? The Human Body app and Mammals app from Tinybop both feature eyes and how they work. We love Tinybop apps – they’re beautiful (take a look – the artwork is stunning) and deceptively simple, encouraging kids to interact with the art to discover and learn. The Tinybop website also has equally beautiful and fascinating handbooks for each app, aimed at helping parents support their child’s learning and use of the apps, with interaction hints to help make the most of them. There’s some nice eye stuff in both of these. This online article for kids explains why animals have different shaped pupils, while this article for older kids/adults explores why the eyes of the animal world are different shapes in more detail. This is great pre-activity reading that helped me explain (in simpler terms) some of these ideas to the kids. 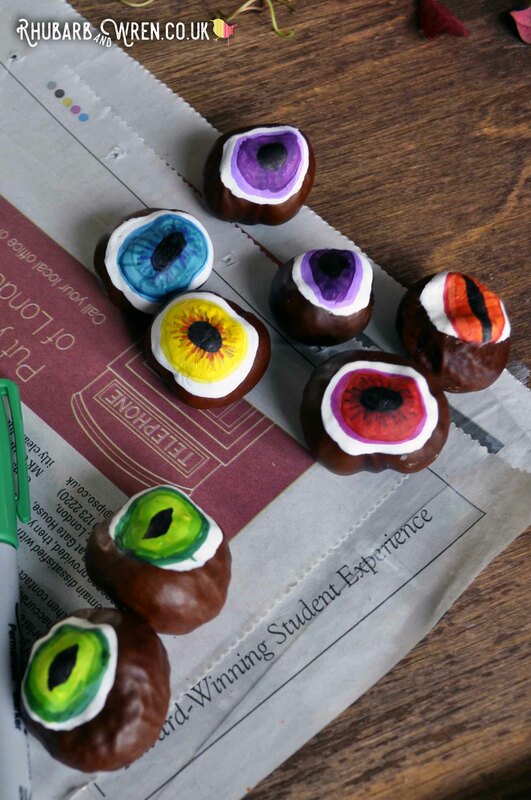 Want to bookmark this DIY conker eyeballs project for later? Save this post to Pinterest! 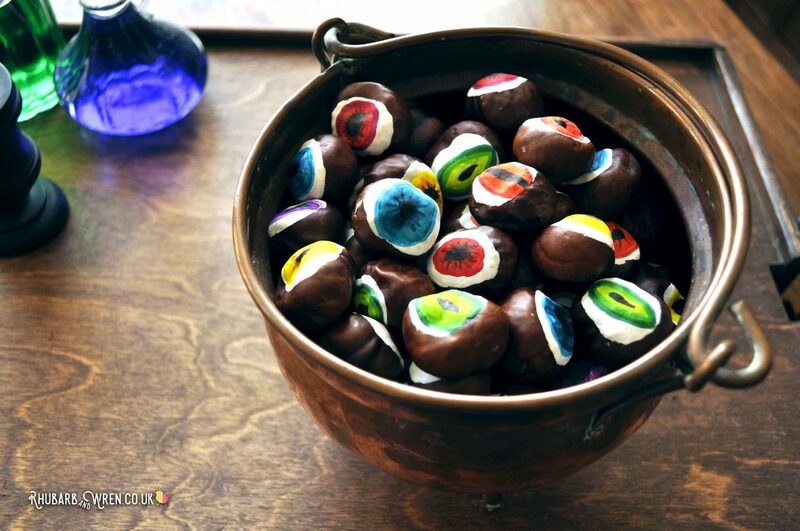 Go plastic-free this Halloween and get the kids using up their old conkers to make all-natural spooky monster eyeballs! A witches broth… eyeball soup! Looking for more fun things to make and do with the kids? Check out these great activities! 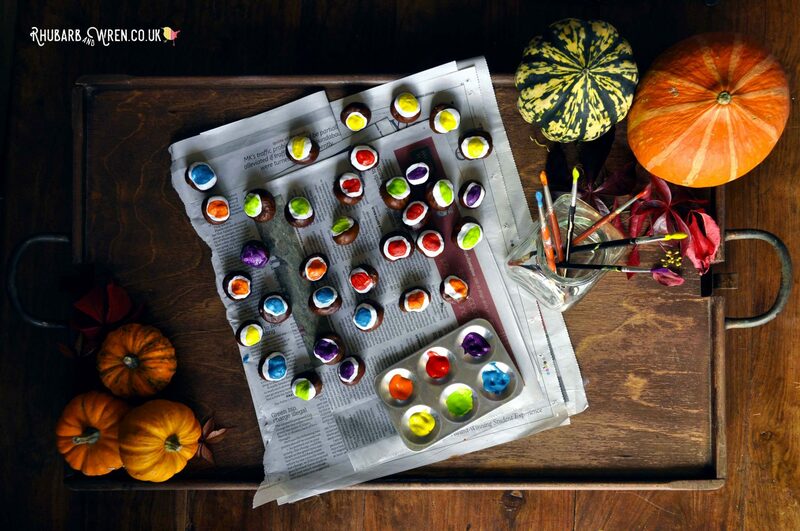 A quick and easy autumn craft for kids that’s perfect for halloween. Look at pictures of geckoes, crocodiles, goats, cuttlefish, and people to see what shapes, colours, and patterns eyes can be. Identify the sclera (whites), iris and pupil of the eye. 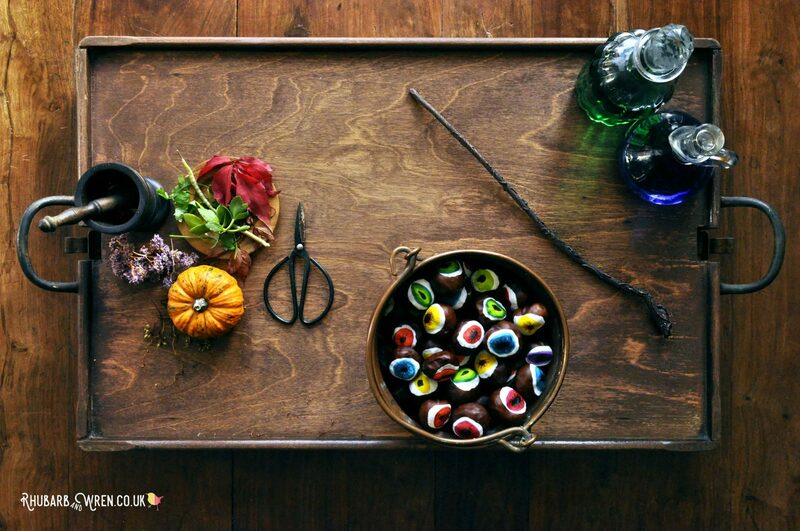 If you are planning to make a necklace of your conker eyeballs, drill holes before you start decorating the conkers. Otherwise, go straight to the next step! 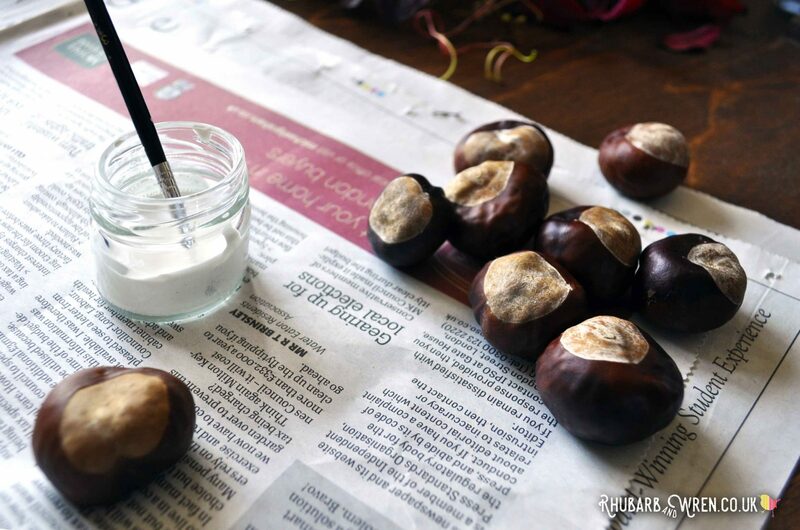 Use white paint to cover the rough part of the conker to look like the whites of an eye – you may need to do a couple of coats. Use colour paint to add the iris of the eye. Remember these can be different shapes and sizes as well as different colours! Use felt tip pens to add in a pupil at the centre of each eye. Just like the iris, pupils can be different shapes, colours and sizes. Use fine felt tip pens to draw in lines and patterns on the iris, just like those seen in your eye research. 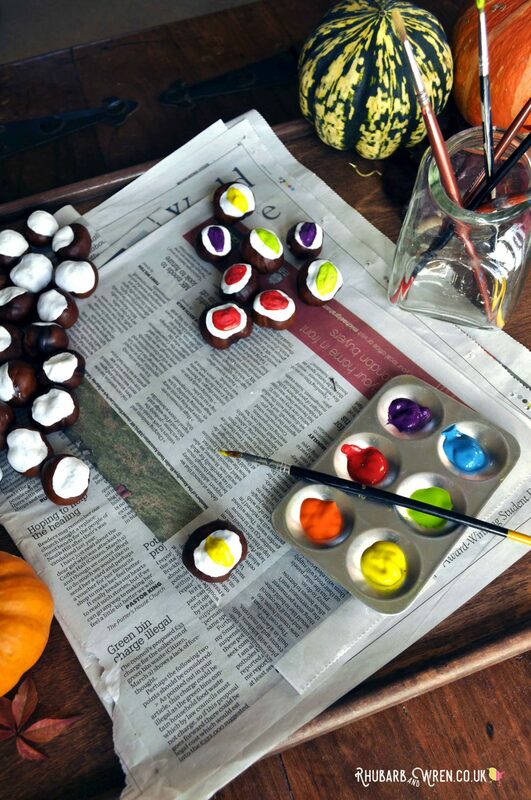 Painting conkers to make conker eyeballs. 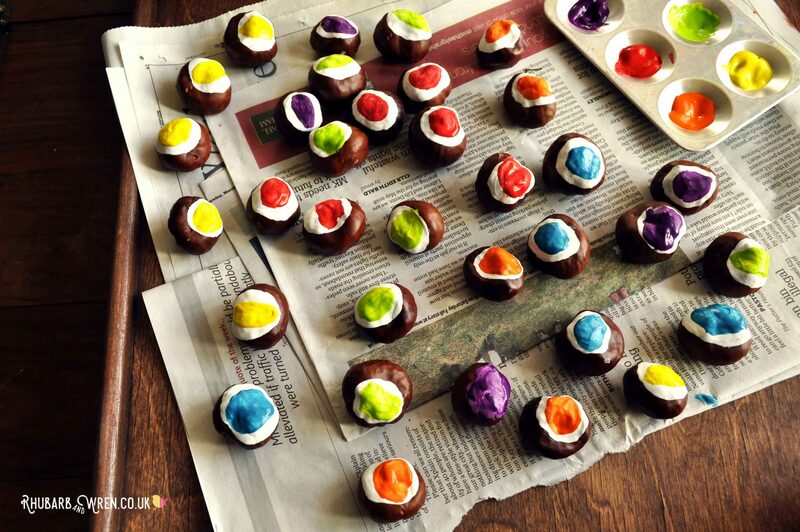 All done… DIY conker eyeballs! Craft, Halloween, Learning Through Play, Nature. Bookmark. What an absolutely brilliant idea, we had a whole jar full of conkers! I love your photos, the flat lay looks fab. Very effective! omg those look so amazing! At first, I was wondering what there were! And it seems so fun to do too! Well done you guys! These are brilliant. They are so colourful yet creepy. 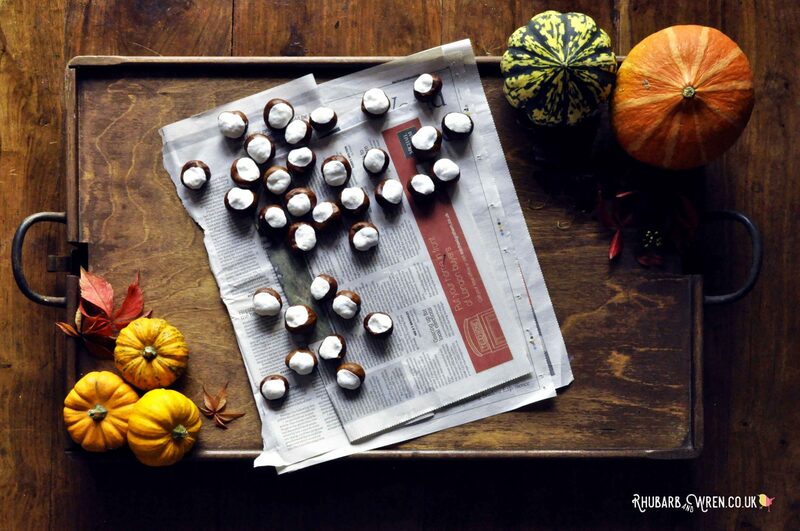 A fantastic idea for all those conkers. These are amazing! We have so many conkers the kids have collected so this would be perfect! Amazing craft for Halloween. This would be wonderful for the doorstep when trick or treaters arrive! Oh this is a great idea!! And they look so effective! we’re home educators so Im going to remember this when we start to learn about the human body, great learning prompt. 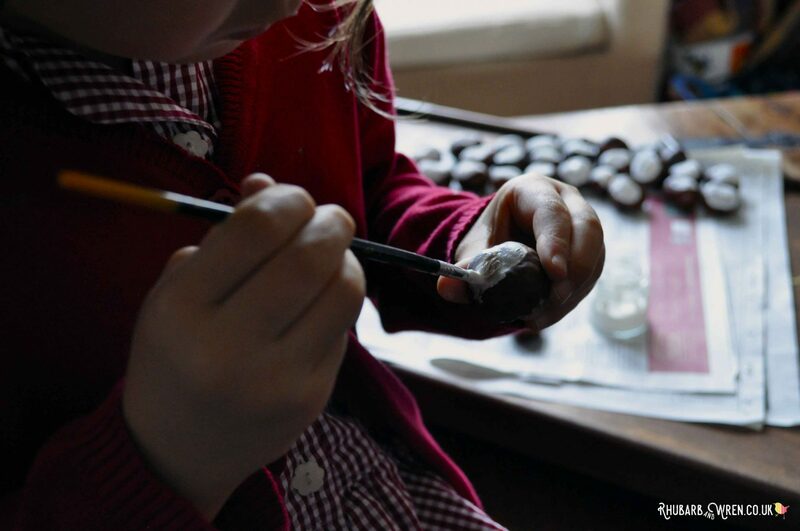 What a great activity to do with children – and thank you for the resources/links too. I’ve learnt something knew today as I didn’t know sclera was the proper name for the white part of my eye. These are brilliant! 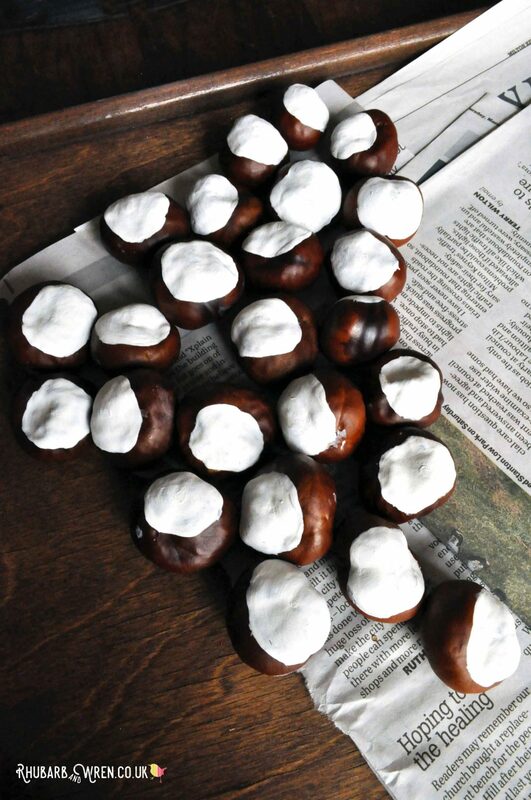 I would never have thought to do something like this with conkers! Awesome! These have come out so well I’m so impressed! I’m so glad the little ones really get their hands into! Please exploit their imagination to their maximum! I’d love to see where it takes them as grown ups! Oh wow! This one is a winner. I would love to try making this. My boys would probably dig this.